Stop Brexit – NUS must fight for free movement and workers’ rights on campus! By Justine Canady, UCL student activist and Student Left Network’s candidate for NUS President. This is an opinion piece. Agree? Disagree? Write a response! 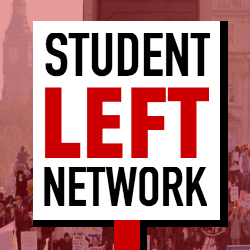 Send to studentleftnetwork@gmail.com Brexit means higher borders, more xenophobia and racism in public life, and a victory for the far right around Europe. It is bad news for our movement, and … Continue reading Stop Brexit – NUS must fight for free movement and workers’ rights on campus! For an NUS that organises and fights for precarious workers on campus! By Justine Canady, UCL student activist and Student Left Network's candidate for NUS President. Marketisation, privatisation and profit-making in higher education is intensifying the exploitation of workers on campus. Students on campus are organising in solidarity with staff, running campaigns alongside trade unions. The past couple of years have seen a spate of victories, for … Continue reading For an NUS that organises and fights for precarious workers on campus! Send this model email to NUS NEC – Vote no confidence in the Trustee Board! NUS democracy is about to be shut down as part of an anti-democratic coup. Members of the elected National Executive Council, the body which exists to make political decisions between conferences and hold the leadership to account, has the power to vote no confidence in the Trustee Board. Ask NEC members to vote to defend … Continue reading Send this model email to NUS NEC – Vote no confidence in the Trustee Board! NUS leadership suspends elections and bypasses democracy – Callout for action! For background on the NUS financial crisis and cuts to democracy, liberation and campaigns, see here. The National Union of Students is about to be changed beyond recognition behind the backs of its membership. Elections for all officer positions are now suspended until after National Conference, completely overriding the constitution and democratic process. NUS President … Continue reading NUS leadership suspends elections and bypasses democracy – Callout for action!